WinCDEmu is a free open source program for the Microsoft Windows operating system that enables you to mount iso images and other disk formats. Virtual CD drives provide you with options to mount iso images and other disk formats directly on a computer system. The approach offers several benefits over burning ISO images to optical disc or storing them on USB Flash Drives. Obviously, you can access data that is on the disc without burning it or extracting it. Additionally, it is possible to mount images on devices that don't have optical drives connected to them, or no USB ports as long as they support image mounting software. Images may also be used as backup copies of optical discs. So, instead of carrying your children's favorite movies with you on DVD or Blu-Ray, you would do so using images instead. No more scratches or misplaced discs anymore. WinCDEmu is an Open Source software program that can mount iso images but also cue, bin, raw, img and smb network shares. It is probably the easiest to use of all the different virtual disc applications. You need to install the program first on a Windows machine, and may select a different directory for the program or set it up to require UAC confirmation whenever images are mounted. You mount supported disc formats either via double-click on the image on the computer, or by right-clicking on the file and selecting "select driver letter & mount", or "mount to an existing virtual drive". The former lets you pick a drive letter for the image, the latter will replace an already mounted image with the new one. From then on out, you may access the contents of the drive in the same way you access other drives on the device. One issue that you may experience is that WinCDEmu won't associate itself with supported image file types by default so that double-clicking won't work initially. You need to associate the file types manually on Windows for that. 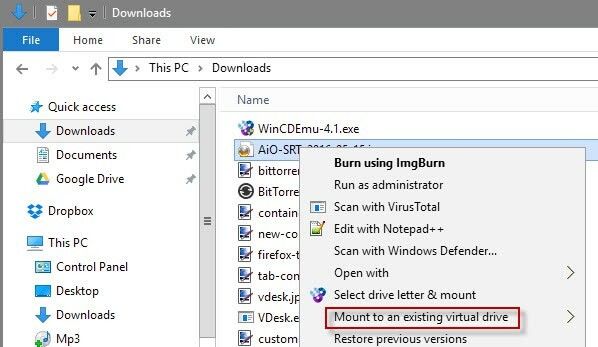 You may disconnect (unmount) any mounted disc image by right-clicking on the virtual drive in Windows and selecting eject from the context menu. WinCDEmu is a straightforward software program to mount iso images and other disk formats. The program supports all 32-bit and 64-bit versions of the Microsoft Windows operating system. The program ships without graphical user interface as it adds all its functionality to Windows Explorer / File Explorer. Since that is the program that most Windows users use anyway when it comes to files and such, it is one of the reasons why it is easy to use. Users who prefer a portable version of the program can download it from the developer website as well. Is it better than Daemon Tools /Lite/? Can you recommend one that works as a portable app? Of course, KDE has this feature built in. KDE users have been able to mount and browse ISO images for at least the past five years that I’ve been using it. I didn’t even know that this feature was missing from Windows or any other environment, I just always took it for granted. Thinker it is different as it is not running in the background all the time. It is basic but should be enough if you only want to mount images. If you need additional features it might be not enough. Well garbanzo, I’m still waiting to hear KDE works in Windows…. If not, who cares about KDE for normal desktop usage? There is also Virtual CloneDrive (http://www.slysoft.com/en/virtual-clonedrive.html) mentioned at https://www.ghacks.net/2008/10/15/virtual-dvd-drive-clonedrive/. I know what you mean. KDE 3 really was the perfect desktop environment, it came with almost anything you could ever need. KDE 4 is nice but doesn’t yet have all the features of KDE 3. KDE 4 should start supporting Windows in a few months, maybe we can coax Martin into doing an article on KDE in Windows. Or just download Kubuntu and use it on Linux. Oh, I almost forgot to stress: you might want to wait a few months for KDE 4.2 to come out. That will be the first of the 4.x series that really is intended for end users, but it still won’t have everything that KDE 3 does. Thanks for the tip. Great program.